Be proud and show your record achievement off to the world, with this bespoke Guinness World Records Record Holder Certificate frame. 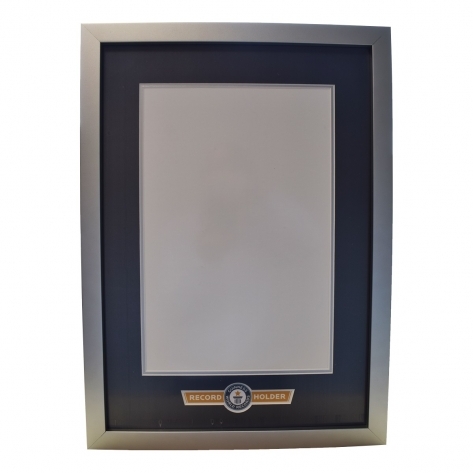 In an exclusive design created specifically for Guinness World Records the frame is made of solid wood, painted in a flat silver finish and comes complete with a navy blue over silver double mount and an inset area featuring the Record Holder logo. The frame has a clear glass front to protect your certificate. The frame is perfectly sized to fit your Record Holder Certificate and includes a serrated hook on the reverse in order to hang your frame. Please note that Record Holder Frames can only be purchased by Guinness World Records Title Holders who hold an approved record. If you order both a Record Holder certificate and a frame, then your certificate will be packaged separately in a Guinness World Records branded presentation envelope and will not arrive pre-inserted into the frame. Many congratulations on becoming a Record Holder. To purchase Record Holder Frames, please sign-in below, using your Guinness World Records account information and password. Once logged in, you will be able to order your Record Holder Frames.